For the first time ever, one exceptionally engineered line of boats has it all. 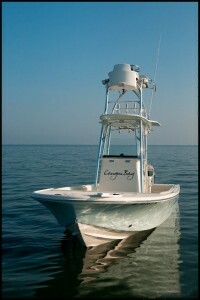 Designed to be the ultimate fishing platform, the Canyon Bay Series combines shallow water draft with Deep-V stability for an unmatched fishing and boating experience. So, whether they’re biting minutes away in calm shallow water, or miles across the chop, you’re on the fish fast, with a ride so smooth and stable it makes getting there half the fun. At Canyon Bay Boatworks, we strive to be on the leading edge in every aspect of boat building, from the design and configuration of all the internal working components, right up to the gel coat. Driven by a total commitment to quality, the materials, construction techniques, and functionality of each Canyon Bay Boat model is at a level that will make each and every Canyon Bay owner proud of their boat and enjoy their time on the water. You will find that Canyon Bay Boats have beautiful fit and finish work, with a quiet, dry ride, seating and comfort features where you need them. Functional fishing equipment is located in the right place designed to work the way it should work, and the helm is ergonomically designed to make running the boat a fun and pleasurable experience. We welcome plant tours, and we are happy to help you locate a dealer to assist you in choosing the perfect Canyon Bay Boat model to fit your needs.